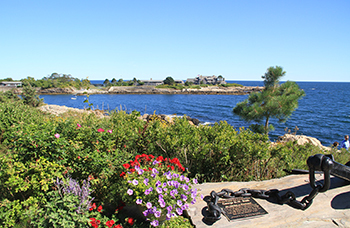 Walkers’ Point is one of the most popular sites in Kennebunkport, the summer home to the Bush family. As you drive out Ocean Avenue past St Anne’s church where the Bush family goes to church, by Blowing Cave and Spouting Rock, you are led to the spectacular peninsula where President George H W Bush, and his wife Barbara, spent every summer with their family from mid May to mid October each year. The people of Kennebunkport love the Bush family, affectionately referencing the two Bush presidents as 41, and 43 – President George W. Bush who often visits Kennebunkport with his wife Laura and daughters Barbara and Jenna (from the Today Show). At Walker’s Point you will see the Anchor to Windward, a beautiful anchor monument that was given to the Bush family from the town of Kennebunkport for their generosity and charitable local efforts. In town, you can visit Ganny’s Garden, a beautiful tribute to Barbara Bush on the Village Green in front of the Captain Lord Mansion – this lovely garden is marked with beautiful birch trees and flowers and bronze commemorative books, she was all about literacy, plus First Lady Barbara’s famous hat and Ked sneakers. Beside taking photos of Walkers Point, or The Bush Compound as some refer to it, one of the best displays of Bush family memorabilia is at Kennebunkport Historical Society’s White Columns. For years referred to as “The Nott House,” this grand 1853 Greek Revival home at 8 Maine Street just beyond Dock Square is now called “White Columns”. Inside White Columns are remarkable authentic period decorations including French hand-painted wallpaper, beautiful antiques, linens and gorgeous chandeliers. 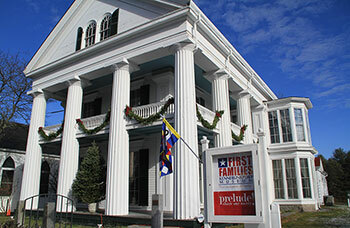 The First Families Kennebunkport Museum is an amzing a photographic exhibit of Kennebunkport’s two US Presidents. Photos of both Presidents Bush and their families at Walkers Point and the White House are on display, along with George H W Bush’s parachute jumpsuit he wore on his 90th birthday when he jumped from a helicopter tandem with a Golden Knight landing at Kennebunkport’s St Anne’s Church on June 12, 2014. 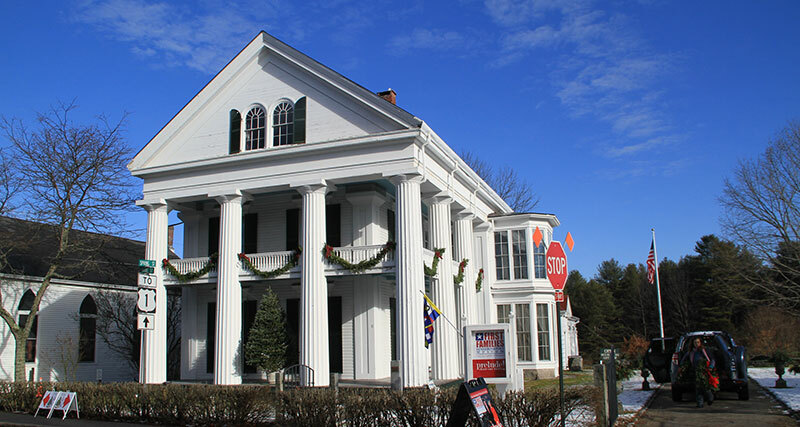 White Columns was owned and occupied by Charles and Celia Perkins in the late 1800s, they made their fortunes during Maine’s thriving shipbuilding era in Kennebunkport, which made Kennebunkport one of New England’s wealthiest towns. 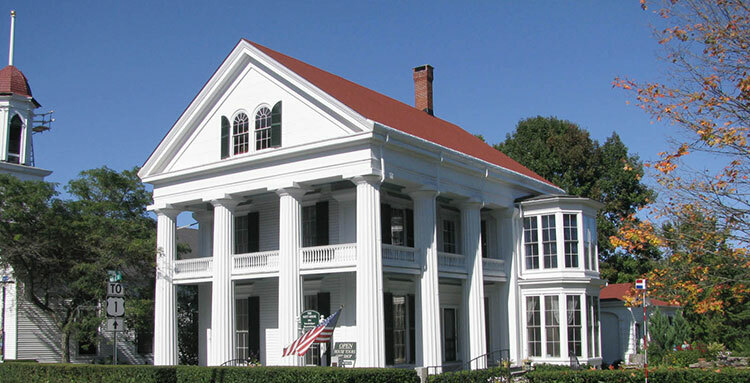 Later the Nott family resided here before the home was donated to the Kennebunkport Historical Society, hence the Nott House name before it was dubbed White Columns. 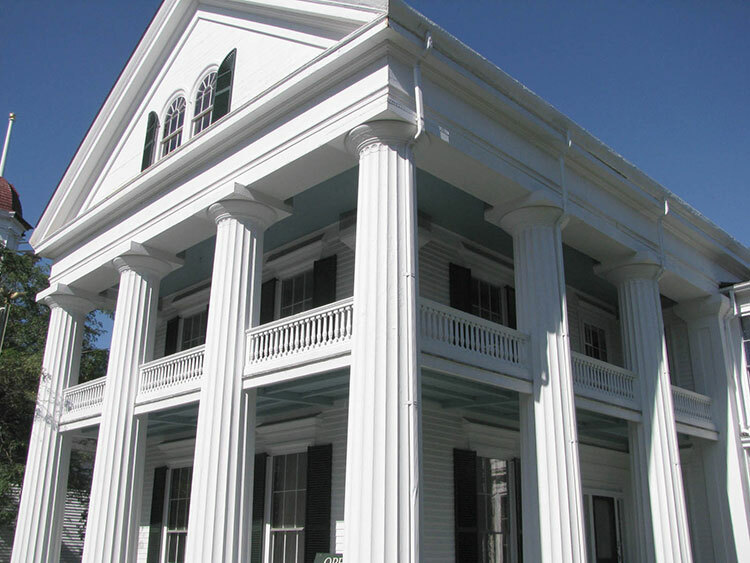 Guided tours of White Columns are offered by the Kennebunkport Historical Society, offering fascinating stories from the days of sea captains and shipbuilders, and fabulous tales of Kennebunkport’s most famous summer resident, former President George H.W. Bush and First Lady Barbara Bush and their Bush family legacy. The Museum Gift Shop located in the carriage barn of the Nott House is a must, here you will find nautical gifts, presidential gifts and games, and hand crafted Kennebunkport treasures for sale – all to benefit the Kennebunkport Historical Society. During the holidays, White Columns is beautifully decorated in Christmas splendor with garlands and Christmas trees in each extravagant room. At Christmas Prelude, the Champagne Gala Reception at White Columns marks the kick off to the first weekend of Preludes as locals and visitors gather in the splendid mansion for champagne cocktails, live classical music, hors d’oeuvres, and tours of the gracious homes. For White Columns Hours and Tours call 207-967-2751. My aunt died at 93 years of age in 2003. Her grandfather family settled in Kennebunkport, Maine. I have no children and her entire estate was left to me. It seems they had the first general store and expanded to a bed and board/breakfast. I know they had many sailors that came there from “across the seas”. I have glass photos, and other photos that were taken in the early 1900’s or late 1800’s. Because I have no children, I want her heritage to be recognized as an important part of Kennebunkport. If the Bush family is interested, or if you know where I can send these (what I think is some wonderful info. ), please let me now. I really want these photos and history forwarded to the best person(s) that can truly appreciate the items I have. My deepest sympathy to the death of President a.D. George H.W. Bush, may he rest in peace! He was one of the greatest presidents of the United States! He has had the fine instinct and the will to resolve and realize the cold war and the reunification together with the equally great Mikhail Sergeyevich Gorbachev the President of the former Soviet Union. Millions of people in Europe and Germany will never forget his historical decision to make peace and not war! I am so thankful for his historic and far-sighted action, may other leaders of the world follow him.